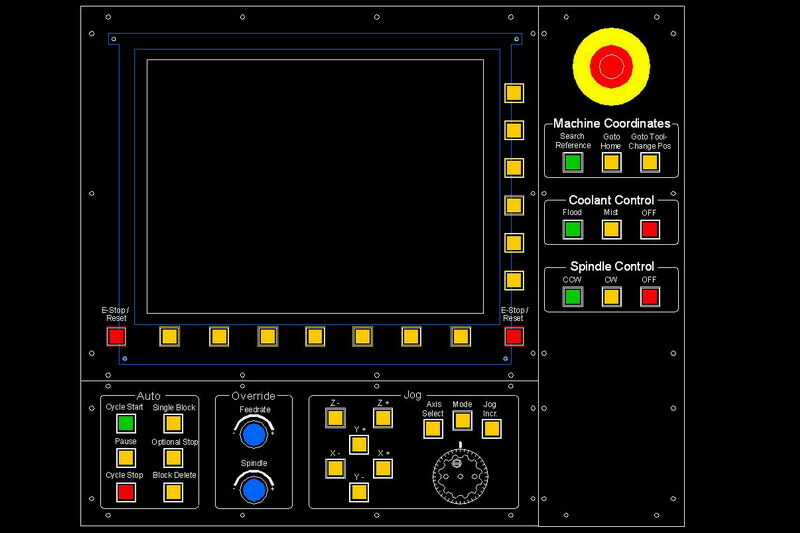 Well, with the machine almost ready I thought: Hey, I need another project, why not build a control panel for it. 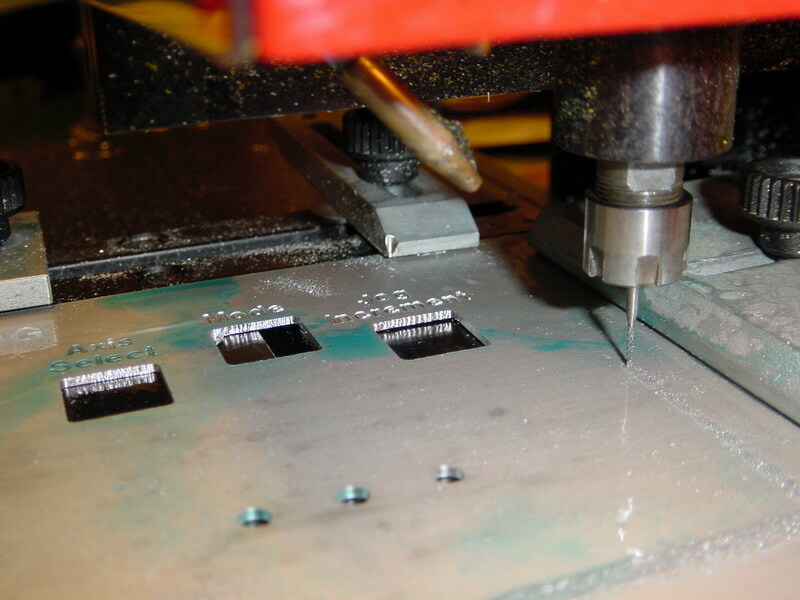 Besides I didn't fancy the idea of fiddling with the mouse and keyboard with metal chips flying all over the place. In retrospect it seems I can't let go of the mouse even though I have this panel, but that's another story. 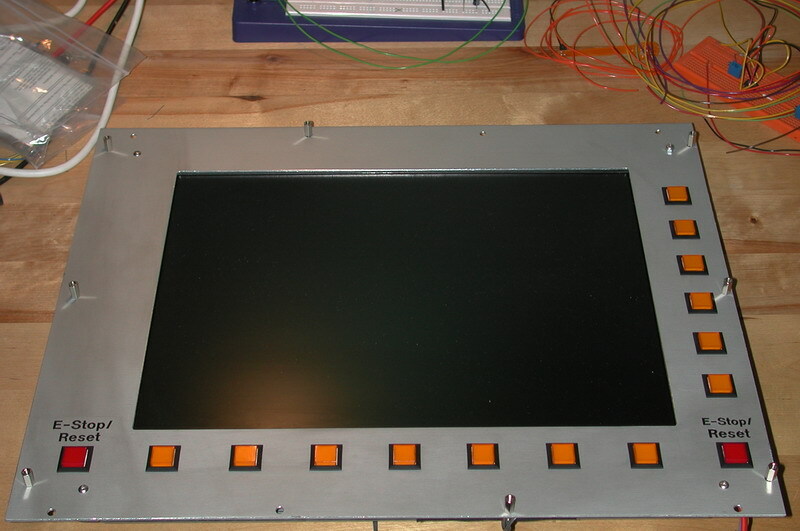 The idea was to use a 15" LCD-screen and mount buttons around the perimeter of the screen and then, by using Mach3's screen designer software I could place labels on the screen indicating what that particular button did at that particular moment. (Known as Soft buttons or Soft-keys). When the designwork was done and the three panels where cut to size I used the engraving machine we have at the place I work to cut the holes for the buttons and engrave the legends. 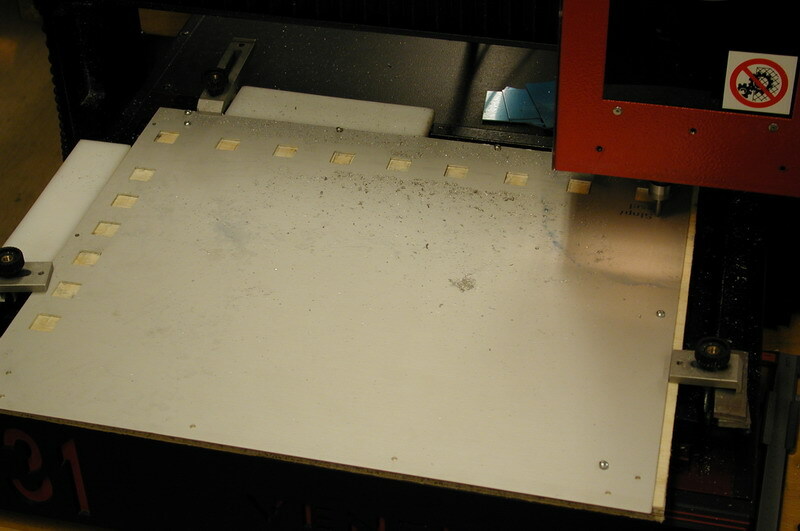 The following three pictures shows the progress on one of the three panels. 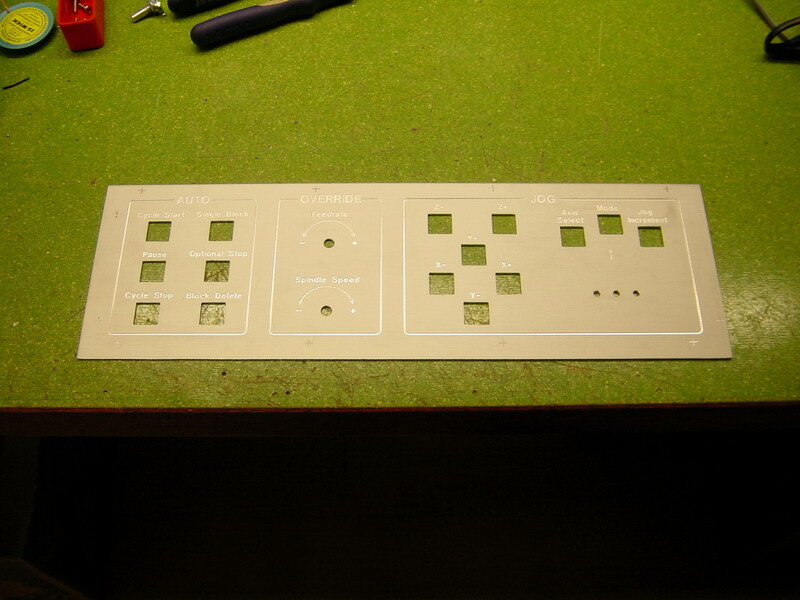 First cutting and engraving, then a cleaned up panel and last the finished panel ready to install the buttons and rotary encoders. 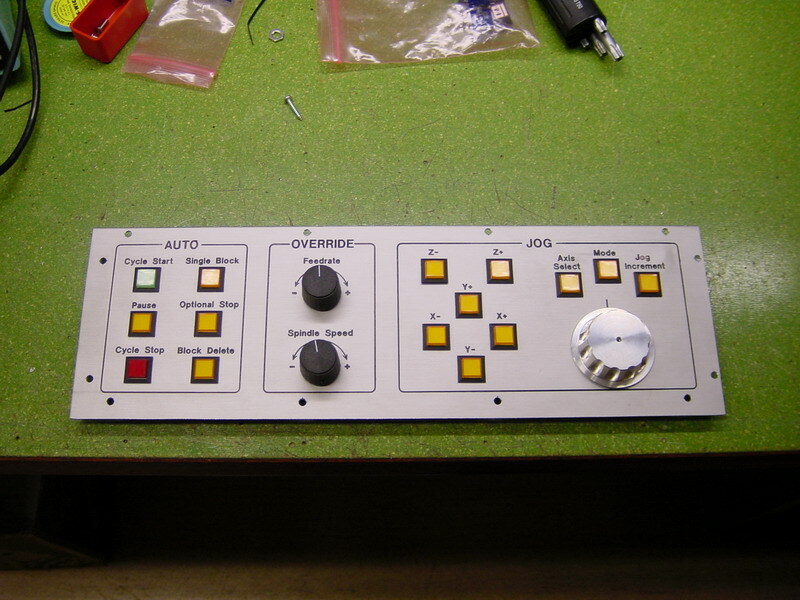 And here's the finished panel with buttons, encoders and knobs installed. The big knob to right was supposed to used as an MPG but I later bought a real MPG and "retrofitted" the panel with one. 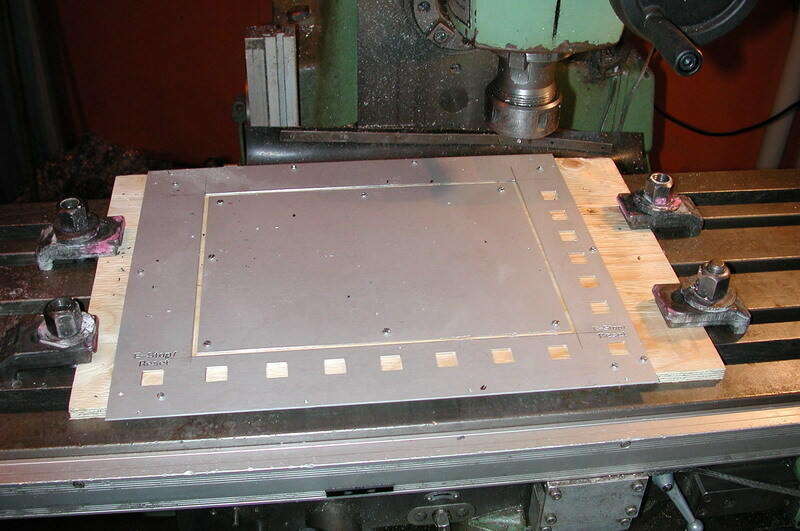 The next three pictures shows the panel for the LCD-screen being engraved and then the opening for the screen is cut out on a little bigger machine. 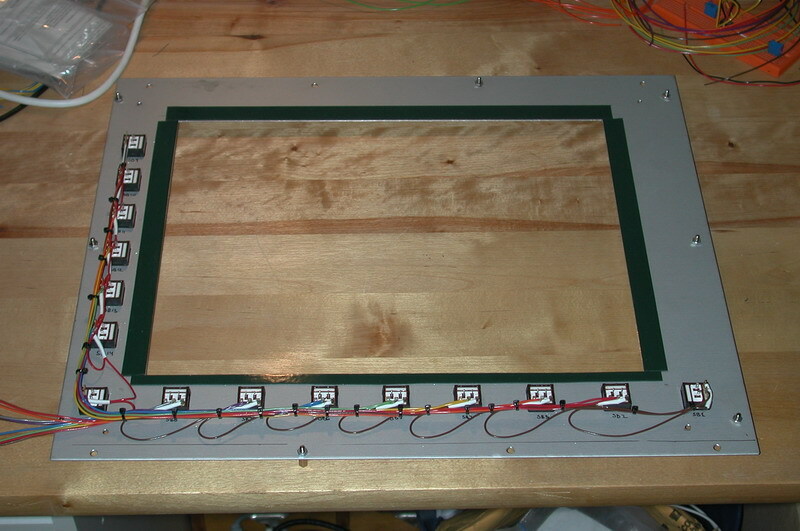 And here it is, first with the buttons installed and then with the LCD-screen mounted and finally a view of the finished panel. The buttons are connected to a X-keys matrixboard which in turn is connected to the PC thru the USB-port. The X-key software lets you program each button to send one or more key-strokes to the PC when the button is pushed. 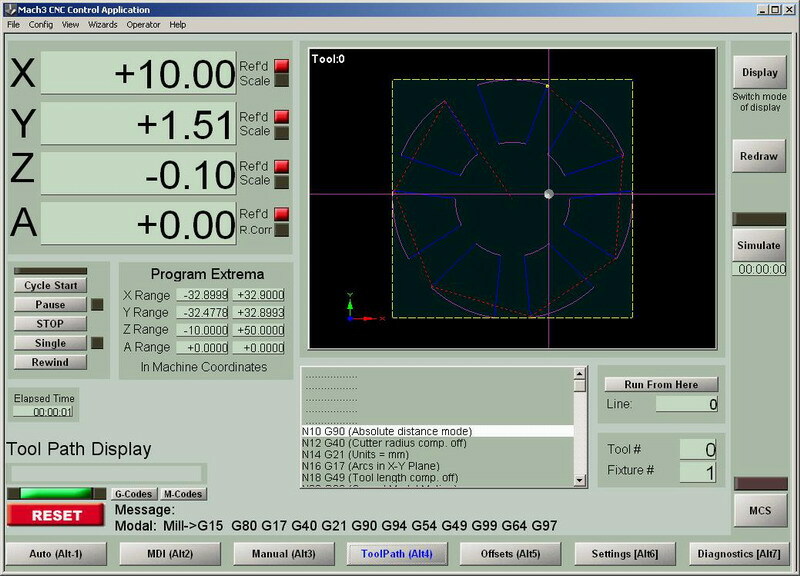 This lets you tie whatever function you may like to the different buttons. The buttons below the screen for example sends the equivalent of pressing ALT+1 to ALT+7 on the keyboard. This makes them switch between the different screens in Mach3. The buttons on the side sends ALT+F1 to ALT+F6 and by putting buttons on the screen along the side and setting it's hotkey property to corespond with the pushputton we have a softkey. 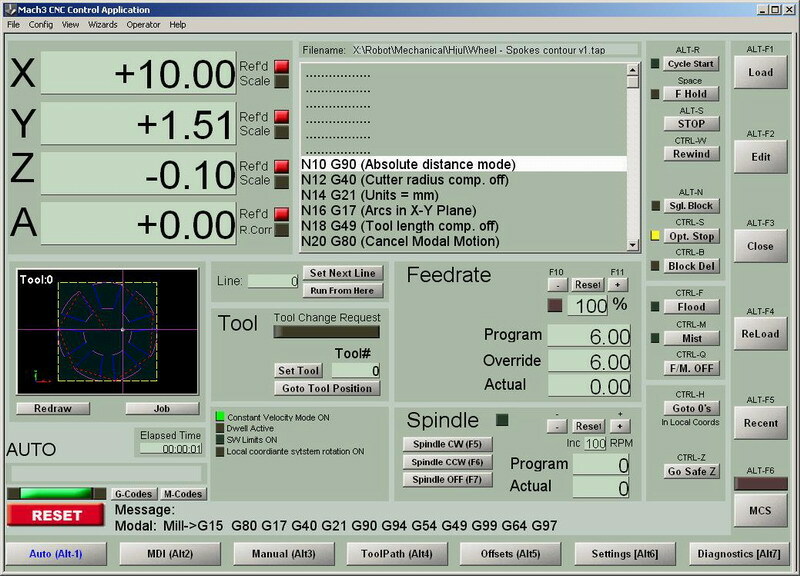 The key, pun intended, here is that ALT+F1 can be used for different functions on different screens inside Mach3. 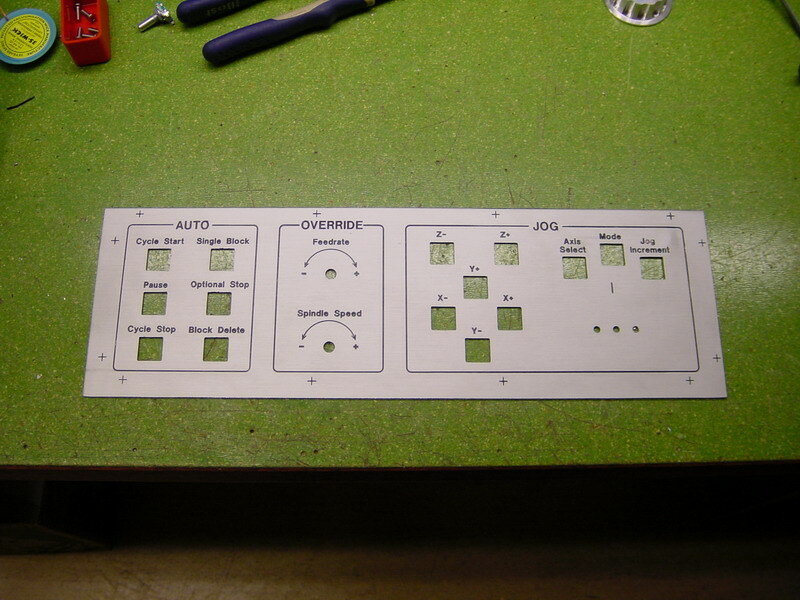 And here's a shot of the internals of the finished control panel. 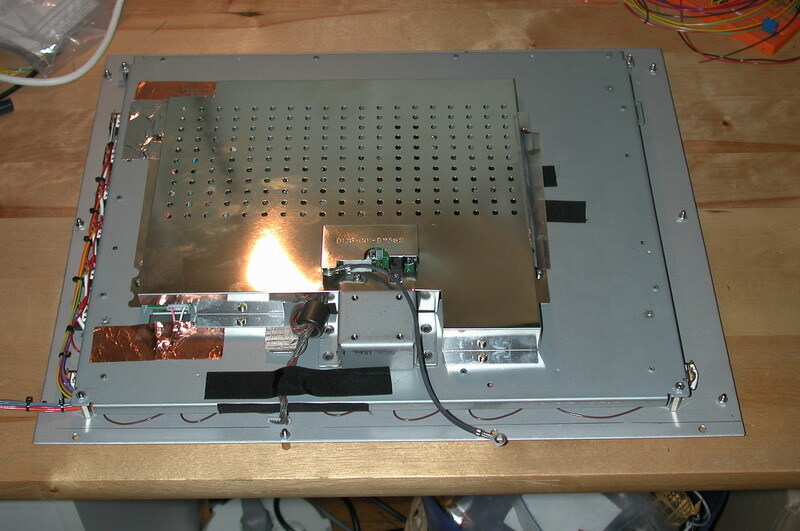 Clearly visible is the LCD-screen. 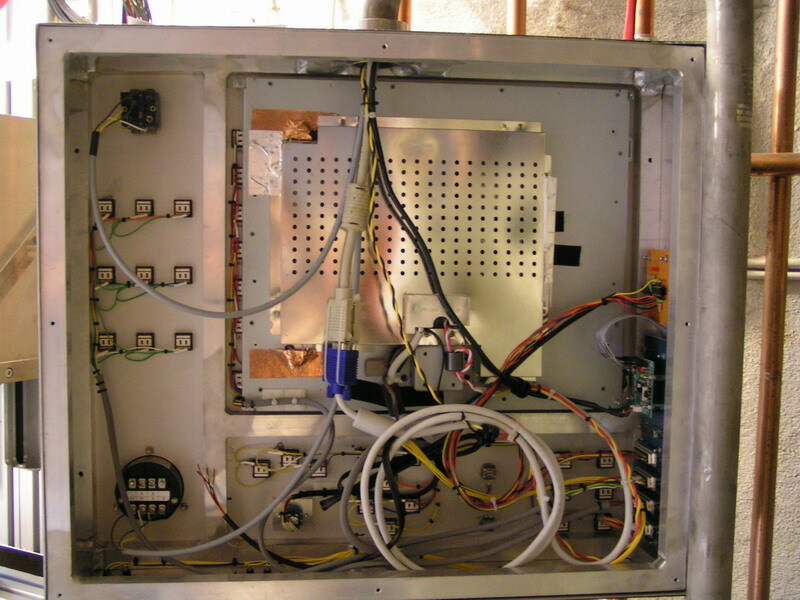 In the upper left corner is the E-stop switch and in the lower left is Nemicon MPG encoder. On the right side we have the X-keys board and above that a little interface board with a PIC microcontroller. 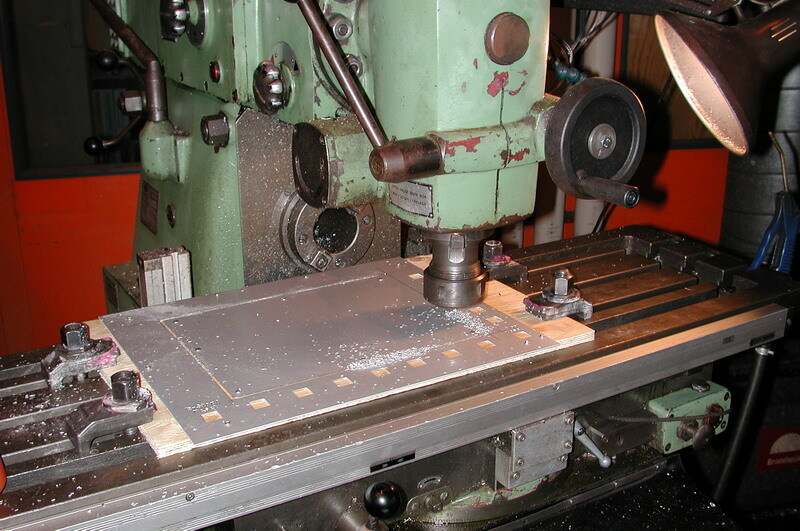 This boards purpose is to read the two rotary encoders (ALPS EC11B-20202) used for feedrate override and spindle speed override and convert the signals to 'key presses' that the X-keys board then sends to PC. 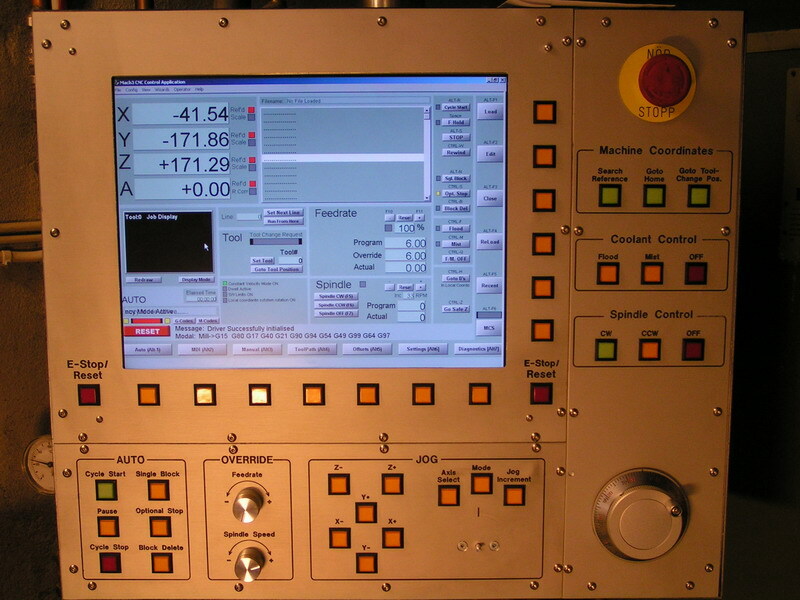 The last photo shows the completed panel up and running Mach3 with my custom screenset. You can see that the original MPG now is replaced with the NEMICON.